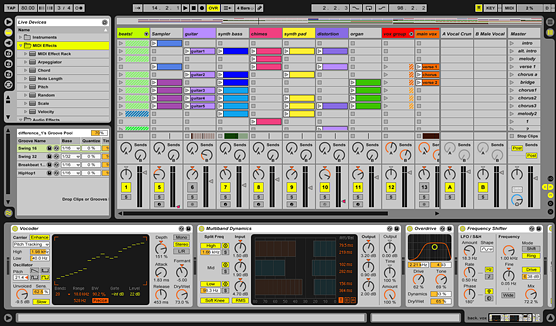 Ableton Live is a music and audio production program that allows users to spontaneously compose, capture, remix, improvise and edit your musical ideas. Live allows users to mix in electronic, acoustic and virtual instruments, as well as digital audio recordings and samples, together in one intuitive interface. With Live, users can focus more on music instead of the gears. The Ableton Live Demo is available for download, it allows for a 30 day trial that users can use as long as they have internet connection. An Ableton Live Mac version is also available. Capture and cut samples on the fly, mix and match audio with differing tempo, and audio effects, all while the music is playing. The whole music making process can happen in real time. Ableton Live allows users to focus on inspiration and creativity instead of focusing on setting up gear for performance or recording. Up to 32-bit/192kHz of Multi Track recording. Bugfix for crashing when performing 'Undo' after dragging a sample onto Simpler's breakout view. Bugfix for bug with active control scripts loading when activating additional control surface. Added support for M-Audio Axiom Air 25, 49 and 61 keyboards. Other bugfixes are available at AbletonLive's latest release information. Posted by Breity on Fri, 02/10/2012 - 01:08.
" now we gonna Party like it's 1999 ..."
Posted by Anonymous on Mon, 08/15/2011 - 09:11. Ableton does everything better and has a really intelligently designed user interface! Posted by Daniel B on Tue, 06/24/2008 - 04:14. Cool software. Happy to recommend. Posted by sateesh on Fri, 04/04/2008 - 14:43. Posted by Navjot Gill on Wed, 04/25/2007 - 18:56. Posted by mc tearer on Wed, 03/12/2008 - 17:54. Posted by steve on Sun, 10/15/2006 - 18:57. Posted by toni on Wed, 07/05/2006 - 11:35. Posted by carl leach on Thu, 06/30/2005 - 14:55. Posted by kye on Thu, 06/17/2004 - 21:50. Posted by dj more on Thu, 07/08/2004 - 02:47. Posted by sutanu on Thu, 09/18/2003 - 04:18. Posted by fxcannon on Tue, 04/01/2003 - 06:56.